For close to 50 years, Shalom House Fine Judaica has been bringing the finest in Judaica from Israel and Around the World to the Los Angeles community. Established in 1971, Bernice (Z”L) and Larry (Z”L) felt there was a need for a Judaica store in the west San Fernando Valley. Life cycle events were something to be celebrated and the store carried items for the Bris, Baby Naming, Bar and Bat Mitzvah, Wedding and of course Shabbat and Holidays. Over the years the store grew into one of the Premier Judaica Stores having customers throughout the United States and Around the World. Bernice and Larry’s son, David, decided to go into the family business. David has an eye for finding the artistic, unique and unusual in hand crafted pieces. Joining him is Stacey and their five daughters involved in one aspect or another carrying on the tradition that Bernice and Larry put into place so long ago. We are here to answers questions about Jewish life cycle events. We are here to guide you in picking out the perfect Talit for your Bar or Bat Mitzvah. We are here to help you with your Wedding needs from the Breaking Glass to choosing the beautiful Ketubah that will become a part of your new life together as a couple. If you have a question feel free to ask, call us, or email. 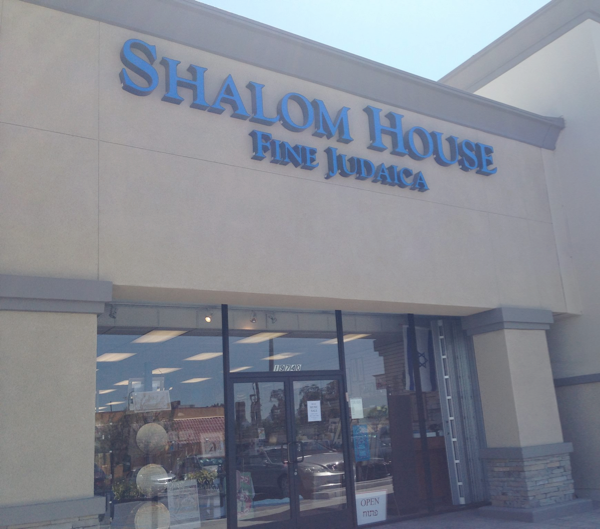 When in the Los Angeles area make it a point to drop by Shalom House Fine Judaica. The store is bright, filled with music while you browse through hand crafted Judaica such as Mezuzot, Ketubot, Kiddush cups, Tzedakah boxes, Menorahs-Chanukkiot, Traditional ritual objects, Artwork and much more!